sense of the day after dinner. All the while, organizations aim to grow revenue, expand abroad and lower costs. To deliver on objectives and business priorities, organizations need to make quick business decisions and act swiftly. Those that don't, after all, will be in a constant struggle to keep up with the competition. As organizations race to meet their business goals, what's one thing that can be neglected? Consistent and effective internal communications. 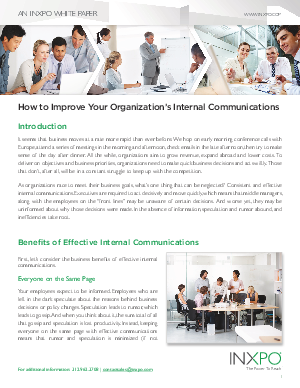 Read this white paper to learn the business benefits of improving your organization's internal communications - and how to do it.